Detailed review of Global Healing Center Latero-Flora. See how this probiotic supplement compares against all the others! Overall, at 2.5 out of 5 stars, Global Healing Center Latero-Flora is just an average probiotic. There are some qualities I like about it but it falls flat in other areas. I like that it seems to be really allergy friendly. I don’t see any major allergy concerns and it’s also gluten free, non-GMO, and vegan. The product doesn’t test on animals. It’s also more stable because you don’t have to refrigerate the probiotics in order to keep them alive. They do well with keeping the probiotic simple and free of artificial ingredients and preservatives. It’s also safe for kids 3 years and older. This probiotic suggests you take 2 capsules daily, which normally I really prefer just taking one and being done. The directions say for adults to take 2 capsules with water every morning, 20 minutes before eating. It then says to reduce dosage to 2 – 3 times weekly after a month of use. For kids 3-12 years old, it says they should take 1 capsule daily and if needed you can open the capsule and mix in purified water or mashed fruit. I also wish that this probiotic was more diverse. With only 1 strain and 1 billion CFU, it’s not very effective. I didn’t really notice any improvements with my IBS symptoms or overall digestive function. Also, the strain that’s used hasn’t been researched that extensively. I’d prefer a daily probiotic that has more solid strains used such as Lactobacillus acidophilus or Bifidobacterium bifidum. So overall, at 2.5 out of 5 stars, Global Healing Center Latero-Flora is just an average probiotic because it’s safe for kids and allergy friendly but isn’t diverse and the strain used isn’t that well-researched. Global Healing Center Latero-Flora contains 1 billion cells in 1 probiotic strain. The strain used is Brevibacillus laterosporus (B.O.D.™ strain), which is a spore-bearing microorganism. Brevibacillus laterosporus is a soil-based probiotic and hasn’t been extensively researched as other more popular strains such as Lactobacillus acidophilus or Bifidobacterium bifidum. Nevertheless, the research that has been done has been promising. This particular strain may be able to help support a healthy immune system, repopulate the intestines with friendly bacteria, and promote a healthy digestive tract. It also seems to have antibacterial properties and may help prevent yeast infections. Global Healing Center Latero-Flora seems to be really allergy friendly. I don’t see any major allergy concerns. It’s also gluten free and the strain is non-dairy, since it’s a soil-based probiotic. As a perk, the capsules are also non-GMO, vegan, and made in the USA. They also don’t do any animal testing. The other ingredients include: organic gum acacia, Kosher certified vegetarian capsules. For 60 capsules, lasting 1 month, it costs $24.95. When you break it down, it works out to $0.83 a day to take these. This ends up being slightly higher than average compared to other daily probiotics. I think it’s a decent value for the price but I’d rather spend my money on a probiotic that’s more diverse in strains and CFU. 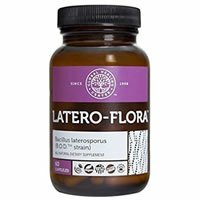 I didn’t notice any negative side effects when taking Latero-Flora. This is definitely a gentler, less potent probiotic (which can be good and bad at times). Global Healing Center offers a 180-day, 100% money back guarantee on their products. I was super happy to see this! They even pay for return shipping, which isn’t always common. If you aren’t 100% satisfied with the product, just return it within 180 days of purchase and you’ll get a full refund. It’s pretty simple and straightforward! To buy Global Healing Center Latero-Flora, click here.